Technology, Electronics, Reviews and Geek Gossip: What is what you do ? Once in a while I find myself in the situation of having to answer the classic recurring question: "What is what you do?". It is not rocket science, but I don't have an easy answer in few words given that they won't convey the deep complexity, knowledge and dedication for what I've been doing for a very long time. The simple and short answer would be "Electronic Systems Design", or when people may know what I'm talking about "Embedded Systems Design", and expanded answer would be "Research and Development of Embedded Microcontroller Applications with Networking and Intelligent Graphical Human Interfaces and Internet of Things connectivity." To give you a more mundane and simple example, there is a lot of people talking about "smart" things like the nest thermostat, well, I design the guts of that kind of stuff. Let me share with you how the process is, and as the saying goes, one image is worth a thousand words, but I'll add a brief explanation of each step. The images above are for one of the products I developed and sold through my website, it is a circuit board slightly smaller than a credit card and that has a network interface chip, a simple microcontroller as the main processor and some non volatile memory. The microcontroller is programmed with the "firmware" that implements the TCP/IP protocols used to communicate over the Internet, and it has sort of a small web server, that once the board is connected to the Net and powered, will let you access it from anywhere around the world to turn things off/on, check sensor readings like temperature, etc. Like many ideas, a product like this may start as some gibberish block diagram on a napkin, the back of a store receipt, etc., but it then a more formal process begins using the right tools for the job. The first step is to identify what components will be used and research how they have to be interconnected and what stuff is needed to make them work. 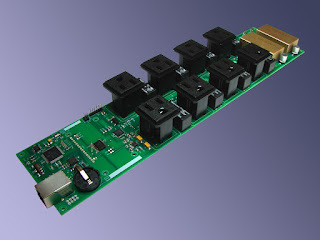 Also for more complex designs and particular components the process includes testing and validating the components using "Eval Boards or Kits" or just samples. Then using a specific CAD program (Computer Aided Design), in the past I used Eagle Cad (now owned by Autodesk) but several years ago I converted into Altium. There are many other CAD programs available including the very popular one called KiCad. These CAD tools when used on the Electronics Design process are often called EDA for Electronic Design Automation, essentially the assist you to capture a representation of a component (called a symbol) and its package layout or footprint for later use in the design of a circuit board. Once you have the symbols you can put together the schematics (shown as 1 in the picture), that show all the components, its values and how they need to get interconnected. If everything goes well with the prototype, the next step is to design the printed circuit board layout (shown as 3), again with the EDA program, this consists in placing the components and drawing the traces in one, two or more layers of conductive material that will interconnect them. When multiple layers are used on a circuit board we create a sandwich of conductive and non-conductive materials, what we call the "PCB Layer Stack" or just "Stackup." The EDA program will generate a set of special files that will be used for Computer Aided Manufacturing (CAM), this includes the files to produce the circuit board, place and solder the components on it. Picture 4, shows another tool I frequently use to inspect the CAM files. Again, not always but often, just a few printed circuit board prototypes get done for testing and verification, to save costs (shown as 5) this particular prototype has no solder mask (a green protective and non-conductive thin layer) or legends. If everything goes well then, real production begins (6 and 7), and the boards get programmed and tested, put into antistatic bags and get ready for shipment around the world. Being this simple board, or a more complex design like the nest thermostat, it may require lots of research to learn the specifics of each components, some of them like more advanced microcontrollers have hundreds or thousands of pages of documentation that I need to read and digest, and experimentation using development kits, others prototype boards, etc. The picture on top of this article shows a partial peek to my collection of development boards, evaluation kits and my own products and prototypes. 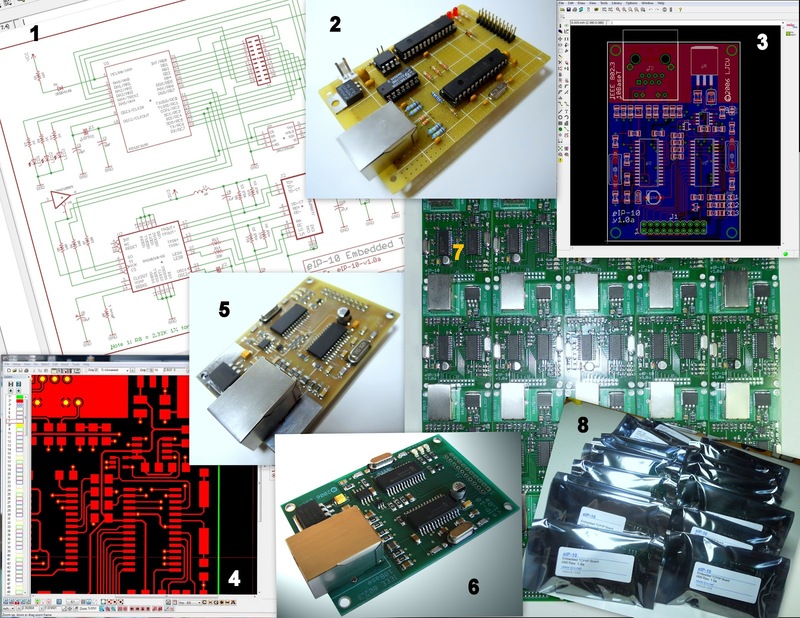 Over the years I developed hundreds of electronics boards and systems, sometimes as final products but often as a part of component of a major piece of equipment or appliance. Lately I've been mostly focused on designing advance HMI (Human Machine Interface) modules and Internet of Things to enable "machines" to be connected to the Internet and monitored/controlled remotely. On this picture you can see me in action at my office/lab working on a new design while testing some finished ones and validating some components. Great information have been posted by you. I am well impressed with your work and effort which you have made in this post. If you are looking to know detail on electronics design and development then contact us.